The karuta cards in Japan are typically seen a symbolic part of New Year. There are competitions to select the karuta queen and their male counterparts. Many TV stations like to focus on karuta playing and in many homes throughout Japan it is customary to play karuta. Karuta has deep roots in Japanese society and the custom provides a great insight into Japanese culture. The idea of the karuta game is to claim as many cards as possible by taking cards from the other side. In order to do so, your knowledge of Japanese poetry is essential. Fast reflexes and good memory is important. There are many different types of Karuta cards and generally can be bought for around $15 – $20 depending on the exchange rate at the time!! 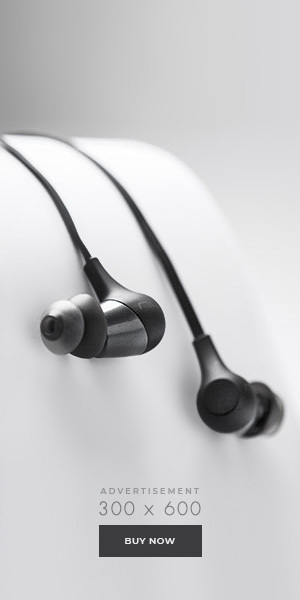 But more elegant sets have also been fashioned over the years. 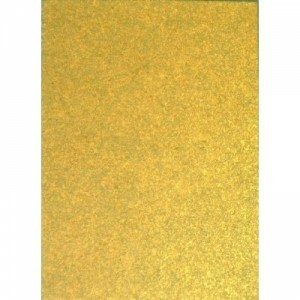 Well-known painters and gold foil sets have been reproduced and these sets are very expensive but much treasured. 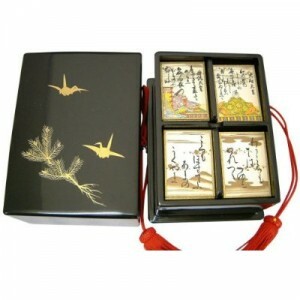 I have found a very elegant type of karuta on Amazon and am quite amazed at the beautiful design. 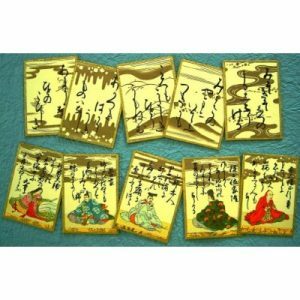 The lacquer, the fine gold foil and the elegant calligraphy are beautiful. I am not sure I would let my family loose on this set of cards. I will keep them to Uno Attack!! Much more in keeping with their style I think. But it is certainly wonderful to find this collectors piece online. What board games do you play at New Year with your family? Do you collect items such as these? I wonder if there is a market for antique karuta sets. Does Japan have a program like Antiques Roadshow? Probably not – I certainly haven’t seen one. Have you? RT @tweetmeme $1000 Cards, Japan Amazon | Shibuya246 http://bit.ly/4TExDC That’s expensive set of cards. Thanks – I know!!! Wow – I bet the lacquer is lovely to touch! !